Bartacks and Singletrack: What he (mostly) did not wear. Not this outfit is the answer. 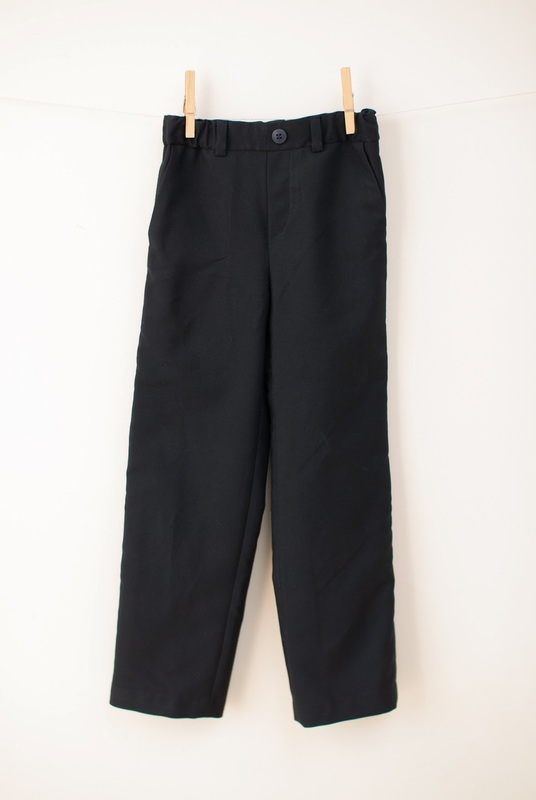 We've had a pretty cool start to summer so I was happily imagining making the Art Museum trousers and vest and a new long sleeved Sketchbook shirt so that P would have some formal duds that didn't show too much wrist or ankle. He is growing like a weed! I'd made the vest and was almost finished on the shirt when the heatwave hit. I finished making the trousers knowing that it would be cruelty to force this outfit on a child in this weather. To be honest we've mostly been in the nuddy when we've been indoors at home lately so I don't even have any modelled photos. 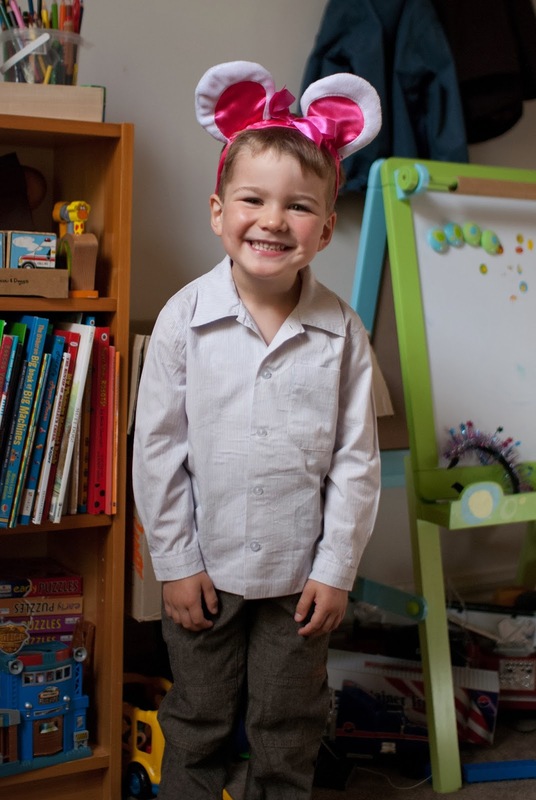 He wore those mouse ears all the way into the city on the train with his dad. 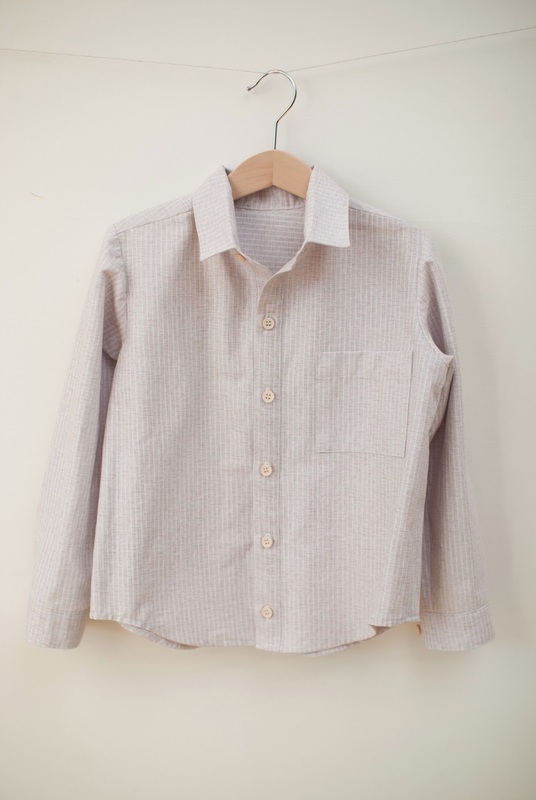 That shirt was a Burda pattern which I'm about to revisit but I far prefer the Oliver + S Sketchbook shirt. The fabric is a quilting cotton which I found in the country town quilting shop near my folk's place. When you're in a country town and it's hot and the quilting shop has air conditioning and a toy bucket why wouldn't you hang out there? My one stuff-up (there always has to be one, right?) was to put the buttonhole placement template on upside down and mark the buttonholes wrongly. 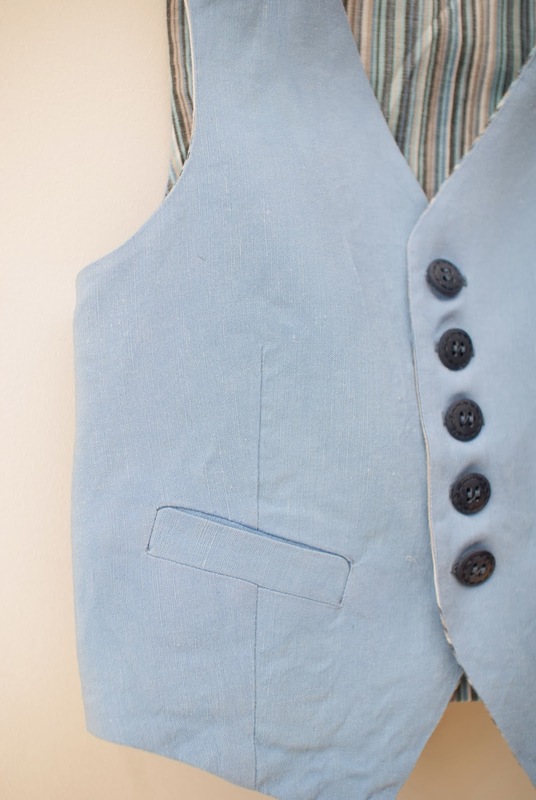 The bottom-most button definitely looks too low, but since I'd never button higher than the one that's done up in the picture above it doesn't really seem to matter. I stole (from someone, I forget who) the idea of cutting the back yoke crossways so that the stripes didn't have to match. Obviously I idolise the Oliver + S patterns but here's why. The instructions for bits like these sleeve plackets are awesome. 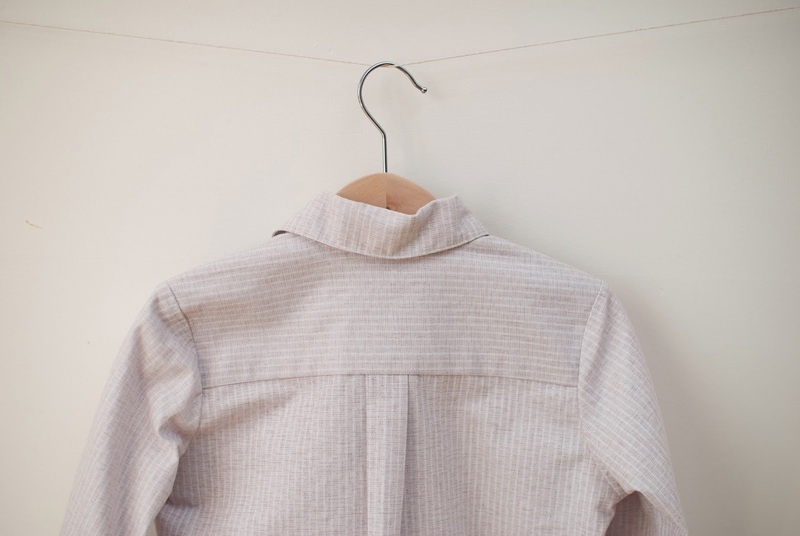 Liesl includes tips that are missing from other patterns (hello Burda shirt) that makes it so much easier to get a great finish. 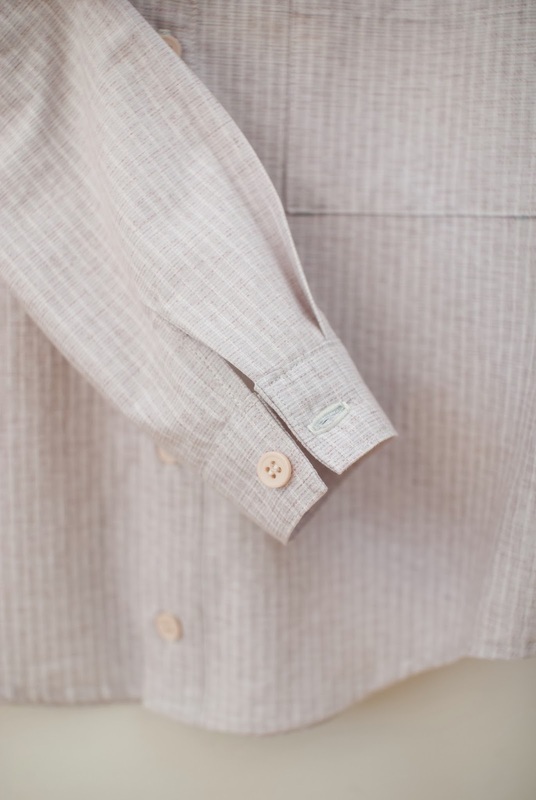 And that's why, once I'd worked out what a welt pocket was (which I learned from this discussion thread on the Oliver + S forum), I knew there could only be one pattern designer to teach me how to sew them. Enter the Art Museum pattern. I had a sneaking suspicion this vest could end up as an exercise-in-sewing-for-me kind of thing. That is, it might get flatly rejected. So I used a very cheap linen and some left over shirting for the lining. 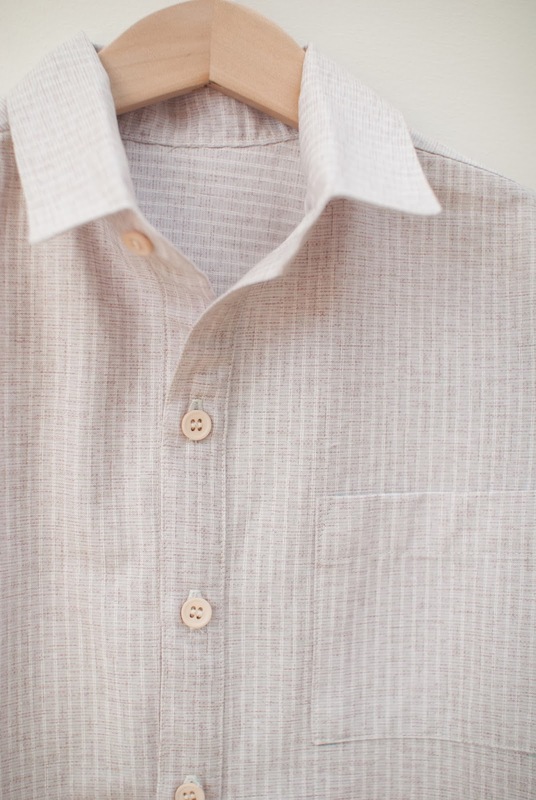 I was amazed to find linen on sale at $3/metre, but the more I look at it I'm not surprised. It has a slightly knobbly curtain like texture up close and turns vaguely purple when ironed with heat. I'm doubting the veracity of it's linen-ness. However it behaved well and my first ever welt pockets were sewn. Anyway, on to the trousers. Yep these are not pants, these are trousers. To the British that might seem obvious and I apologise to them for having said a rude word (ooh-er) but to me it's a line between casual and a bit more dressy. Hanging them up like that I can't believe how long they look! I cut a size 5 in width lengthened to size 6 at the hem and they're perfect. They are quite a slim fitting trouser so I imagine a straight size 6 would have looked OK as well, but I'd measured my kid so thought I'd do it right for once. thats' some serious sunshine coming in left of picture! In weather like this there's nothing nicer than surfing the net and looking at northern hemisphere blogs and all that lovely snow! Stay cool everyone. Thanks Rachel. That photo of P from his "pink ballerina" phase is one of my very favourites and I still get a chuckle thinking about him sitting with my husband on the train like that. No, not a real fly. I'm a bit nervous about trying a zippered fly and luckily, for now, P hates pants with fiddly bits. If you ever want to sew these kinds of pants this would have to be the pattern it really was surprisingly easy. These look great. Aren't the welt pockets fun to make? Bad luck about the heat wave: never a problem in my town! Do you think in about 10 years time P will want to report you both to the child welfare agencies for allowing him to wear those pink ears on a tram, in public?!? It's not like it was an AFL scarf, or even a Boy Scout uniform! I agree though, he looks very cute!! The pink ears were entirely of his choosing. One for the 21st birthday photo board for sure. It's kind of sad when kids reach the age when they become aware of how others perceive them. This year he only wore his ears once we were inside the theatre (although obviously not during the show, he's tall enough already). We should all take risks with how we present ourselves like 3 year olds do sometimes! Fantastic sewing effort - very impressive, especially those perfect welt pockets. Pity about the weather ruining your clothing plans... but I'm sure you're enjoying the cool change. 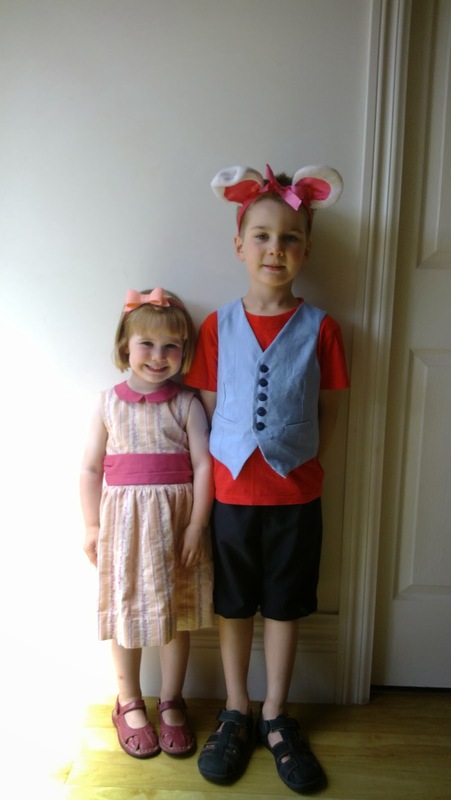 Love the pink ears photo - my son was fond of pink and used to make a beeline for the pink tutu in the dress-up box as soon every time we went to playgroup. Thanks for the sewing love, and yay for kids who are happy with whatever takes their fancy and for parents who are cool with it too. fantastic outfit! So impressive and looks professional too. So many beautiful clothes!!! 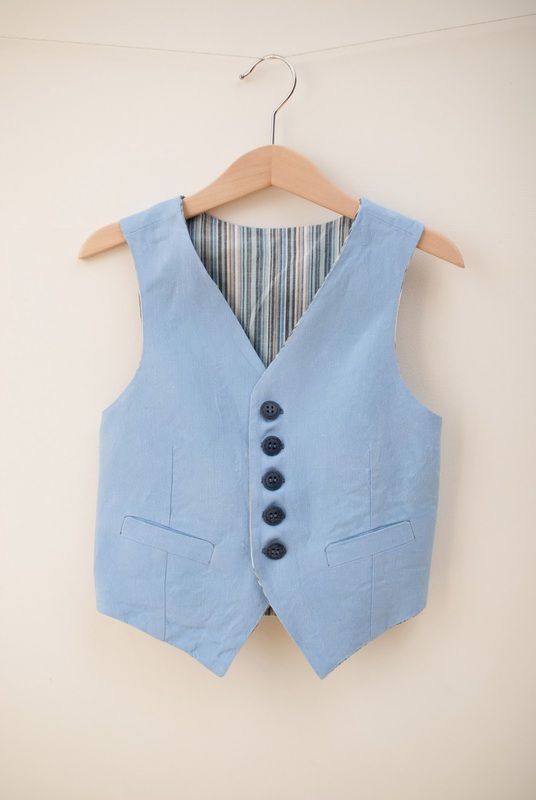 You have inspired me to make the vest for my son for Easter. I am scared to make the pants but maybe I'll do that too since I really love making the "whole outfit"
Go for it Christine. All the instructions for the pockets are in the vest part, so once you've made that you'll be on a roll to make the pants as well. Thanks Rachel. I'm sure you know they won't be as hard as you imagine. Another one of those look-at-me-I-feel-clever moments when really it's the pattern writer who's the clever one. 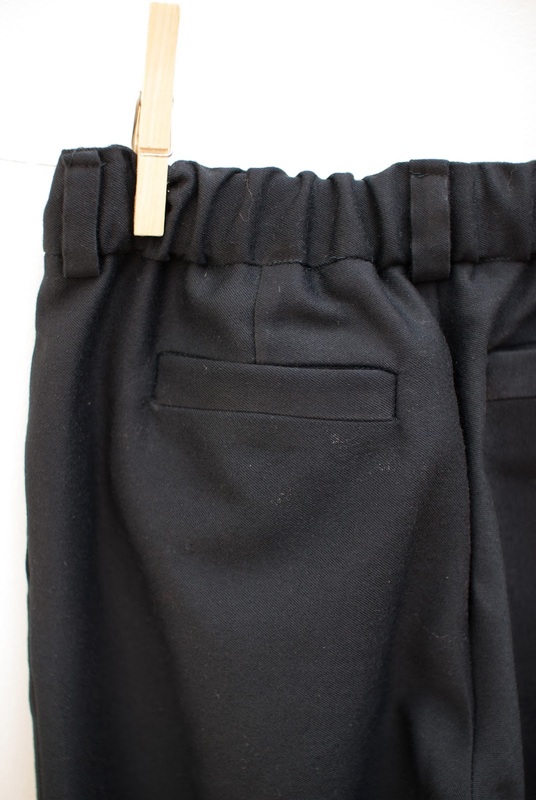 Yay, Oliver + s for teaching us how to make welt pockets, right? They aren't as hard as I thought they'd be. I love this ensemble so much, and it's a shame he couldn't wear it, but hopefully the outfit will have its day when it cools off a bit!! I can see all of your hard work here. It looks like you lengthened the vest, because that pattern looked like it is a bit short. It looks great how you made it! How did you lengthen it? 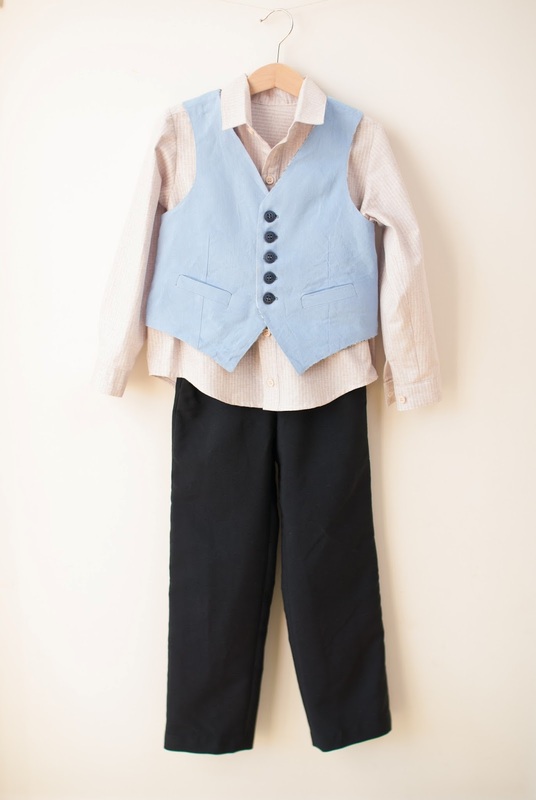 I'm going to try the vest and pant for my 2 year old (size 2T) to wear as ring bearer in a wedding, and this is the first time I've ever sewn clothing...adventurous huh? Lol! No, no adjustments, it was exactly as per the pattern. This kid has most of his height in his limbs not his torso, so your mileage may vary. I wouldn't say itsitsia short pattern though.